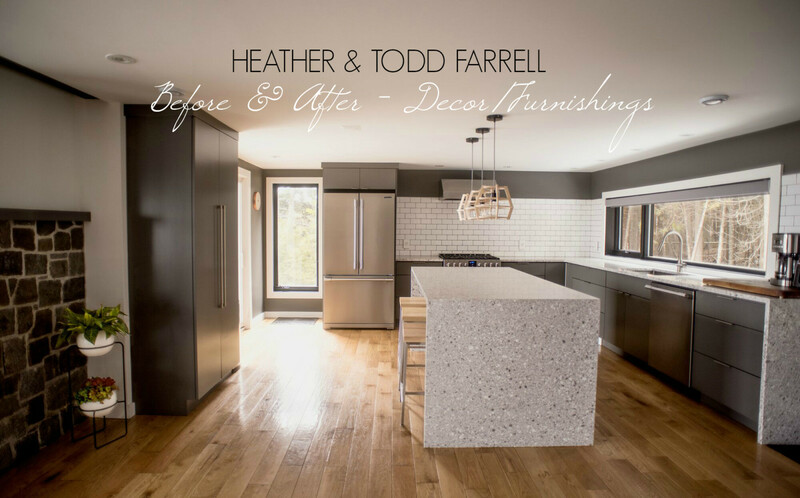 In January 2017, Todd & Heather Farrell reached out to us after just completing a remodel of their entire home on the Saint John River. We couldn’t have been more honoured to be given the opportunity to come in after the dust settled to assist with the finishing touches in their new space. 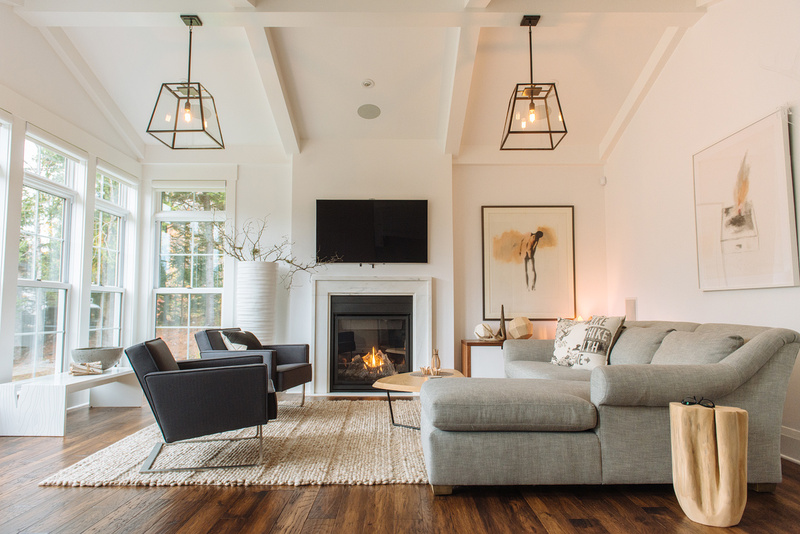 We quickly got to work sourcing lighting, furniture, and decor to compliment their existing pieces and accent the beautiful remodel. The before photos are not the dark and outdated ones we’re used to featuring on our before and after blogs. Coming into the project after the renovations were complete, we were greeted with an amazing space to work with! We’ll share the undecorated home as it was the first time we saw it. To kick off the After photos we’ve got this adorable photo of Daisy (left) and Duke (right) relaxing in style! As always, we would like to thank everyone who worked on this project especially Todd & Heather for welcoming us into their home and allowing us to be a part of this transformation! Who wouldn’t want to be greeted by Ryan Livingstone? In the entrance, we hung four of Ryan’s 13″ x 13″ Vintage Valentino Reduction Reliefs to add some much needed colour. Framed in Umbra’s black floating frames to coordinate with the black architectural features throughout the home. Featured: Gus* Modern Stanley Console Table beneath four Ryan Livingstone Vintage Valentino 13″ x 13″ Reduction Reliefs, Chilewich Black & White Shag Rug. The Living Room was in much need of some cozy elements! We painted the back wall Benjamin Moore Gray 2121-10, brought in a new Gus* Modern Jane Sofa, accent chairs, and rugs to make the room feel comfortable, topped off with some Pony Rider Cushions & Throws for extra coziness! Three Umbra Hub Mirrors, a Gus* Modern Elk Chair & Wilson Cabinet, and Heather’s framed photography anchor the back wall of the Living Room. Clean lines and simple (but beautiful) furnishings complete the room without distracting from the incredible view outside. To unify the Kitchen with the Living Room, the space above the cabinets and wall tile was painted Benjamin Moore Gray 2121-10. New natural wood pendants and Stanley Stools from Gus* Modern complete this minimalist kitchen. What better place to inject a bit of fun than the Powder Room? We love playing with bold patterns in small spaces. For this room, we chose a JF Fabrics Antiquity wallpaper. You might recognize this hallway from an earlier blog post, How to Tackle That Big/ Long/ White Hallway where we show how we came up with this design and the process leading up to the reveal. Thank you Legacy Painters for your hard work on those stripes! The Bedrooms were nearly perfect; they just needed the “cherry on top”! We installed new lighting, painted an accent wall in each room, and brought in a few small decorative items. Their Boston Terrier, Duke, enjoying a nap in the new room! Mirroring the downstairs powder room, we hung another bold floral wallpaper from JF Fabrics in the upstairs washroom to make a big statement in a small room. A few decorative elements were all that was needed in this minimalist Ensuite Washroom. The leather sectional that used to be upstairs was moved downstairs to the Living Room where it was dressed with some Pony Rider cushions and a new coffee table. The artwork above the sectional is by Robert Moore. DID WE MENTION THIS HOUSE IS FOR SALE? That’s right! The house is up for sale! View the listing here and contact the wonderful team at Decourcey & Company for more information on this beautiful home!